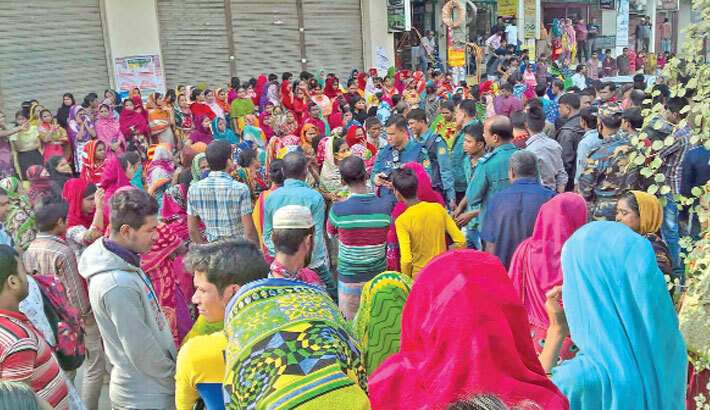 Workers of a readymade garment factory blocked the busy Kuril-Biswa Road in the capital on Wednesday, demanding payment of salary arrears. The demonstration resulted in heavy congestion in the area, which caused immense public sufferings. Later, police rushed to the spot and managed to drive them out of the place. Police said several hundred workers of a garment factory named Euro Zone Fashions in the area under Vatara Police Station took to the street around 1:30 pm. Mousumi Akter, a garment worker, said the garment authority assured the workers that they would be paid on Wednesday. But as they were not paid, they become angry and staged the demonstration in front of Queen Merry College, she said.